Ebrahim Raisi, member of the 1988 Massacre’s “Death Commission” assigned as the highest judicial position within the regime. In dictatorial regimes, people reach senior positions based on their lack of respect for justice or having special connections with those in power. For positions of power in repressive organs, these appointments are carefully considered and people who are appointed must be competent at wielding suppressive weapons, the survival of the regime depends on it. We can take a look at the so-called “moderate” cabinet of President Hassan Rouhani, formed in 2013. 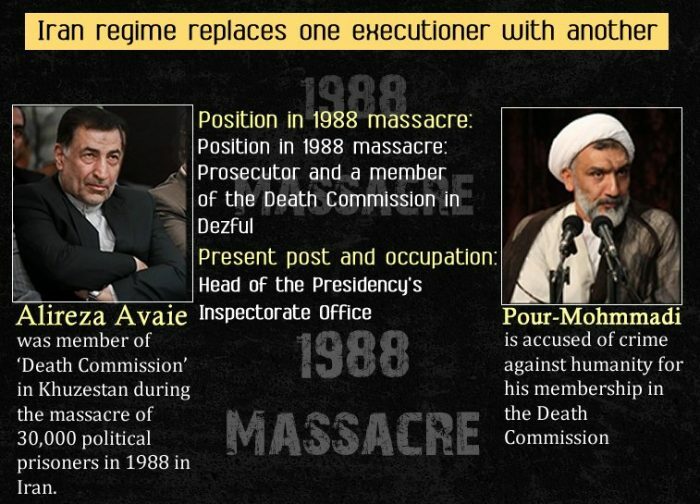 In addition to Rouhani himself, there were many overtly oppressive cabinet members like Mostafa Pour Mohammadi, the former regime Minister for Justice, who was a member of the “Death Squads” responsible for thousands of executions in 1988. The selection of Pour Mohammadi was a clear signal to the Iranian people that Rouhani’s administration is anything but moderate and that they should not expect any leniency in judicial matters of political dissent. Rouhani’s moderate political slogans masked the hideous face of the clerical regime. Essentially in the culture of the clerical regime, the publicly announced policies bear no resemblance to the political reality of the regime. Repression and limiting civil liberties drive every policy decision. This is most apparent in the regime’s relationship with the main political opposition group, the PMOI. The People’s Mojahedin Organization of Iran is the largest and most organized political force that has opposed this regime throughout its forty-years existence. It is worth pointing out that in the Iranian political landscape, no force is more ideologically opposed to the clerical regime than the Peoples Mojahedin Organization of Iran (PMOI / MEK). The regime’s ideology is rooted in Khomeini’s interpretation of Islam. But the MEK’s view of Islam is radically different from that of the Khomeini’s regime. For the MEK’s, Islam is democratic and secular. Freedom and respect for human rights are at the core of the MEK’s beliefs, conversely, for the regime freedom has no place in society and is vehemently opposed. It is this fundamental ideological difference that has put the MEK in the regime’s crosshairs. This is apparent in the appointment of Raeisi. In these sensitive times, as public dissent increases and the MEK grows more popular, Rouhani is turning to ‘the hanging cleric’ to crack down on the pro-democracy group. “By emphasizing the need for a change in the judiciary and the beginning of a powerful new era,” Khamenei indicated his priority remains self-preservation at the expense of Iranian human rights. Khamenei declared the year 2019 as the year of uprising and social explosion, appointing an executioner such as Raisi is a direct response to the economic and political demands of the people. Why #Raissi at the head of the judiciary? The fact that “reformers” and “moderates” within the regime welcomed Raisi’s appointment as the head of the regime’s judiciary speaks volumes about the magnitude of the crisis the clerical regime faces. It proves that when it comes to repression, the different factions within the religious dictatorship are united in the shared goal of regime preservation and maintaining their grip on power. Although appointing Raisi as the head of the judiciary shows a more repressive front against political dissent, at the same time, it has opened the regime up to scrutiny from the international community. Governments around the world are abandoning their policies of appeasement. Following Raisi’s appointment, the international community will be even more reluctant to grant concessions to Iran. The regime has made some feeble gestures in an attempt to quell international fears of further human rights abuses. It released some political prisoners and removed some radical elements of the judiciary. However, these are nothing but deceptive moves and should be viewed as such. To call Ebrahim Raisi a “righteous cleric”, as the regime has, is a tasteless joke. 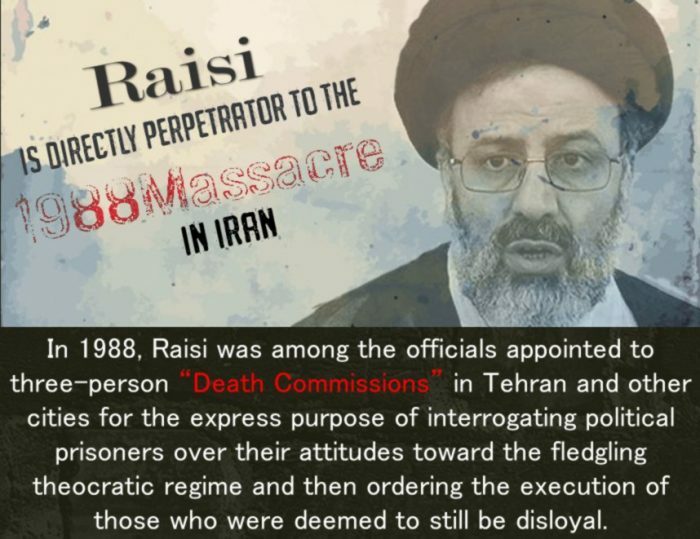 Regarding Raeisi’s righteousness, please refer to Ayatollah Montazeri’s remarks in addressing the Death Committee. 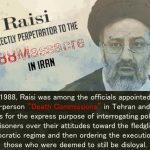 The former Ayatollah turned to Raeisi and said, “you will be regarded as one of the criminals in history.” It is noteworthy to mention that Raeisi is one of the least experienced of all the criminal judges in the system. At the age of twenty, he began his career, as the prosecutor in Karaj, and shortly afterward, for his “abilities,” he served as Hamedan prosecutor at the same time. In 1985 he was recalled to Tehran for his high “capabilities” and in 1988, at the age of 28, he was placed in a senior position in the Death Squad and oversaw the massacre of thousands of MEK political prisoners. If we take this statement by the President of the clerical regime seriously, in a war against the people, and foreign governments, the appointment of Ebrahim Raeisi is part of a coordinated strategy. In this war, Rouhani may be one of their own victims. When you treat your own people as your enemy, it only speeds up the formation and proliferation of the resistance. To call Ebrahim Raisi a “righteous cleric”, as the regime has, is a tasteless joke. Regarding Raisi’s righteousness, please refer to Ayatollah Montazeri’s remarks in addressing the Death Committee. The former Ayatollah turned to Raisi and said, “you will be regarded as one of the criminals in history.” It is noteworthy to mention that Raeisi is one of the least experienced among all the criminal judges in the system. At the age of twenty, he began his career, as the prosecutor in Karaj, and shortly afterward, for his “abilities,” he served as Hamedan prosecutor at the same time. 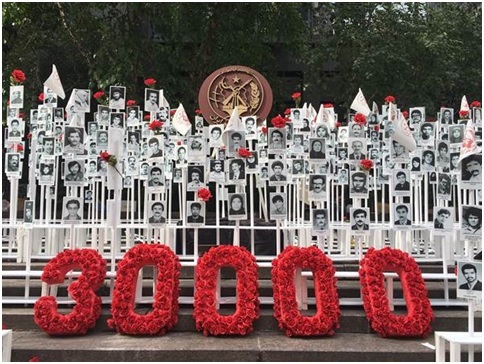 In 1985 he was recalled to Tehran for his high “capabilities” and in 1988, at the age of 28, he was placed in a senior position in the “Death Committee” and oversaw the massacre of thousands of MEK political prisoners. If we take this statement by the President of the clerical regime seriously, in a war against the people, and foreign governments, the appointment of Ebrahim Raeisi is part of a coordinated strategy. In this war, Rouhani may be one of its own victims. When you treat your own people as your enemy, it only speeds up the formation and proliferation of the resistance.